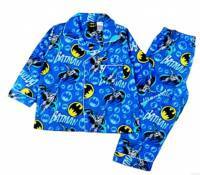 Size 6 Batman Flannelette Children's Winter Pyjamas. This two piece Batman pyjama set is 100% cotton. The material is soft and cosy for a perfect winter nights sleep. Boys will love the Batman print. These Batman Pyjamas are also available in Size 2, Size 3, Size 4, Size 5, and Size 8.